Siddhartha Gautama, the Iron Age ascetic commonly know worldwide as Buddha, believed that balance in life was the best way to attain enlightenment. Buddha’s words about health, contentment, and faithfulness still ring true today and underline the mission of HopeWell Cancer Support. HopeWell has long offered its participants an array of programs for dealing with cancer, recognizing that those affected by the disease need more than just medical care. 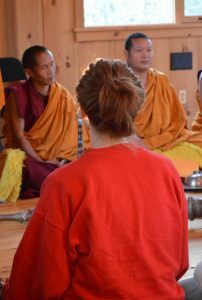 It is in this vein that HopeWell joined with friends from Baltimore Yoga Village this past Wednesday night to invoke divine healing, by hosting a group of Tibetan Monks of the Drepung Gomang Monastery in India. The ninety-minute service, which was primarily comprised of three extended chanting sessions, drew an estimated one hundred people to the cozy barn at HopeWell’s Lutherville campus. The chant sessions were punctuated by question and answer periods which were dutifully translated by one of the visiting monks. The Tibetan Monks are currently on a tour of the eastern United States. Their state-side mission is to teach others about their culture and beliefs and to send money back to their monastery in India. There are five different sects of Buddhists in Tibet. As members of Gelugpa (The Virtuous School), the Tibetan Monks of the Drepung Gomang Monastery follow the teachings of H.H. The Dalai Lama. After a welcome of the eight visiting monks by Pamela Tanton of HopeWell Cancer Support and Anjali Sunita of Baltimore Yoga Village, the interpreter monk explained that the prayers for the evening would include blessings for health. “We ask in these prayers: Please help those who are suffering”. Seated on pillows with their legs crossed and an assortment of instruments within arm’s reach, the solemn octette – dressed in the traditional crimson and gold-colored robes of the Tibetan sect – opened their invocation with three soft gongs and a series of low murmurs. The murmurs were quickly followed by a rising chorus – accentuated intermittently by modal shifts and tones best described as in-between notes wholly unfamiliar to the Western ear. Even in the relatively cool confines of the HopeWell barn, the monks perspired in fervent prayer. Their mesmeric chants continued unabated for 15-20 minutes at a time. The final chant implored the spirit of the Buddha to see people who are suffering and in need of help. The chants, we were told, are designed to open the heart and mind. Concluding the service, our interpreter monk thanked the mostly attentive crowd which had gathered for the evening. “Great karma comes from when people come together in unity,” the monk explained. Pamela Tanton told the Baltimore Post-Examiner she was pleased to partner with the Baltimore Yoga Village for the unique event. “I teach qigong on Friday mornings at Baltimore Yoga Village in Mount Washington so that’s how I am connected to Anjali. When she knew they were going to come to Baltimore, she put the word out to people asking if they’d be interested in having the monks do a program. She’s kind of in charge of figuring out their schedule the whole time they’re here. Tanton noted that, while this was the fourth time the monks have called on Baltimore, it was their first visit to HopeWell Cancer Support. “Normally, everything we do is no charge, but we did ask if people wanted to make a donation tonight to help the monks, and because of the partnership with Baltimore Yoga Village. The donations we received are greatly appreciated. “We had almost one hundred people attend tonight, a number of whom are in our program. Everyone here is called a participant. No one is a patient. HopeWell is for people who have had a cancer diagnosis and their loved ones as well. At any stage of the cancer journey, participants can come to offer hope to people who are just starting out and give advice on getting treatment. Even if they’re feeling terrific and have been here for ten years. It’s for any type of cancer, and there is absolutely no charge. Cancer survivor Elsie Fergusson told us she has been coming to Hopewell for over 10 years. Roberta – another attendee who, like the monks, sat cross-legged on a pillow for most of the evening – echoed Elsie’s observations, and offered two thoughts of her own. Editor’s note: This is the fifteenth part of an ongoing series which will look at the places and people that make up the rich history and diverse nature of spirituality, belief, and observance in Baltimore and beyond. Read the series here.